As the launch of the iPhone 7 approaches, Bluetooth headphone purchases are on the rise, according to new data shared by NPD Group. In June, Bluetooth headphone revenue overtook non-Bluetooth for the first time, accounting for 54 percent of headphone dollar sales and 17 percent of unit sales in the United States. The overall headphone category saw seven percent year-over-year growth in pure dollar sales during the first half of 2016, but Bluetooth headphones saw double-digit growth during the same time period. A solid cost decrease helped spur Bluetooth headphone sales, with average selling prices down 5 percent. Nearly 30 percent of Bluetooth headphones sold during 1H 2016 were less than or equal to $50. "Promotions and new product introductions have helped spur the growth we are seeing in Bluetooth headphones," said Ben Arnold, executive director, industry analyst for The NPD Group. "Consumers are already embracing a wireless future and if, as rumored, the headphone jack is removed from the next iPhone, we expect this will continue to drive market share of the Bluetooth category." Apple's Beats brand and LG dominated the Bluetooth headphone market during the first half of the year, accounting for approximately 65 percent of dollar sales. 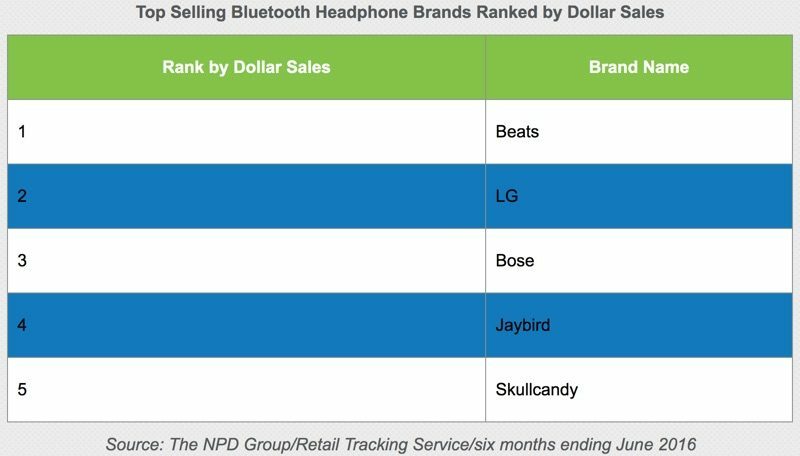 Bose, Jaybird, and Skullcandy were the other manufacturers to make it into the top five brands, in that order. With the iPhone 7 and the iPhone 7 Plus, Apple plans to eliminate the headphone jack, requiring consumers to rely on Lightning adapters, Bluetooth-enabled wireless headphones, or headphones that include a Lightning connector. Apple's decision will undoubtedly lead to even greater Bluetooth headphone sales as the headphone jack is gradually phased out across its product line and from competing products. It's almost like Apple knows better than the common troll when to transition to the next tech....must be luck. The table spacing is nice. "54 percent of headphone dollar sales and 17 percent of unit sales in the United States"
More money from smaller market share. Very Apple. Makes logical sense, just a shame it's so anti-consumer. Okay, I was a pure Bose naysayer. However, I did receive the QC 35's as a present around a month ago and I have been traveling a lot with them recently this summer. And I must honestly say, that they are fantastic. The convenience of being cable free alone is worth it in my books. I only have to charge them 1 - 2 times a week for about 2 hours, and I use them daily for many hours for music, movies, etc. The best part in my opinion is how they've fixed the pairing issue, the companion app remembers the last paired devices, and you can manually switch on which ones to pair to instantly. Also it simultaneously stays connected to two devices, usually my iPhone and MacBook Pro, and can therefore playback audio on one after the other seamlessly without doing anything. Switching them on also makes it pair instantly without hassle, which made me realize that it's even more convenient than plugging in a wired-pair of headphones from one device to another. Two smaller things to note is that you can rename them to your liking and also set exactly when you want them to go to sleep to save battery, so most aspects have been well thought out. The audio quality is great, the cans are very comfortable and the battery life is great, even though it is very pricey. The technology will only get better and cheaper within time, with Bluetooth 5.0 being announced and AptX HD on its way to improve range and quality, this is truly the future in my humble opinion. RIP 3.5mm headphone jack, good riddance. PS: I was also eyeing the B&O's H7's, in the future perhaps because the battery is interchangeable. Don't worrie, it's ranked by dollars. The table would propably be very different if it's ranked by units sold. The LG headsets are powered by Harman Kardon. When the next tech is up to an overwhelming 17% of units sold? Maybe there's an argument to be made for the transition, but these sales stats ain't it. Except that they're not. Read past the misleading headline, only 17% of headphones sold are wireless. Wireless is just generally more expensive. Wired headphones fail all the time because the cable breaks, and not all cables are replaceable. A decent pair of wireless headphone, on the other hand, will work until the battery dies completely, which takes years. Since you're pointing fingers, I'd have to say your argument is weak as well, because not everyone buys BOSE quality BT headsets. Due to the price, I'd say most buy "value" BT headphones, which will probably fail sooner because their electronics will fail. You're both right and wrong, depending on how good of a product you buy. My good headphones have a removable cable so it can be replaced. No other electronics in the cans, they should last forever. BT anything, on the other hand, will fail at some point. Let's just pause here for a second. 17% of units sold is not an overtake (yes the title references revenue). Also, 17% is probably too high because a lot of headphones are given away with the phone or as part of promotions. I have probably 20 different types of wired headphones at home that I never paid for. I actually have a bluetooth that I bought a few years ago, but never use it because I always forgot to charge it.